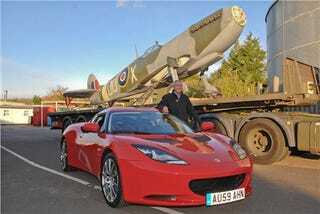 Lotus tasked itself with repairing a painstakingly accurate replica of a Spitfire fighter plane in preparation for the Battle of Britain's 70th Anniversary. Hey, can you think of anyone else with such an expertise in fiberglass? The full-size replica normally sits outside the Imperial War Museum in Duxford, but sustained significant damage when it was flipped over by wind during a storm last year. Lotus intends to repair the body, re-attach the wings and convert the plane from a Mark IX to a Mark II - the model that flew during the battle - by removing the cannon pods. The plane will then be displayed in London's Trafalgar Square as part of a series of events planned to commemorate the historic battle. The Battle of Britain was the first major war campaign to be fought entirely in the air and marked a turning point in WWII, preventing a German invasion of England which seemed incredibly likely after British soldiers were evacuated from Dunkirk. Lasting from 10 July to 31 October, 1940 it was also Germany's first major defeat during the war.